Címlap » The Verdict: Acquitted! My name is Éva Salyámosy. I am a Hungarian Baptist writer, TV and radio media person: editor, director and journalist. God entrusted to me the task that was given to Billy Graham, as well: to serve Him by talking about Him. I led a life without God until I was 44 years old. I thought I had everything. God, however, saw that without Him I had nothing! He had compassion on me, spoke to me and embraced me. Ever since then I have been living a life of balance as I found my way home to my Heavenly Father and found my real purpose in life. At my baptism I received a new task from God: Call unto me in the time of adversity and I shall deliver you. This means that He performs numerous miracles in my life and then I go and tell others about them. This is witnessing. This is why all my books are like this – similar style to that of Jonny Ericson. On my book shows people hugged and said: “We know your works and we’re so happy because we understand it: secrets open up before us! Thank you!” This means a lot to me as God gave this ars-poetica to me: Saying the words of simplicity so that the cross of Christ would not lose its power – as when a person does not understand something, it is already gone. I received this new mission from Him when I was 64. Naturally, He spent time educating me beforehand! I studied advertising and marketing and many other trades which improved my creativity. In 1990 I became a director of the Hungarian branch of ALICO. He called me to set out on His journey from here. Therefore, with my books I am trying to set a way to those who wish to change. God intended this book to be read by three target groups: people who do not yet know Him and so they are afraid of Him, new believers to be educated in the practical Christian life and experienced Christians so that they would worship God for His deeds. 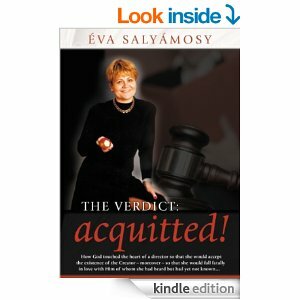 Now you can read my first book here whose title is: “The VERDICT: Acquitted!” It is about how I accepted the love of God and how my life changed afterwards. It is full of humor, youthful matters and serious realizations…It can move you, it is exciting and true! The Lord willing, some other books of mine may also be published in English in the future. If so, He shall send all the finances for translation costs and other tasks. I am a widow without a new husband or a car…so whenever I travel to book shows, I carry my books with my own two hands. I do not complain at all, as I may lack some things in life but I HAVE a GOD! – just as many simple widows with a task had a God. And He testifies: My power will gain ground through your weakness! I’ll help you! My dear and excellent translator was Gábor Jermann. Please, also give me feedback on the email address I marked at the end of the volume. I am looking forward to it!